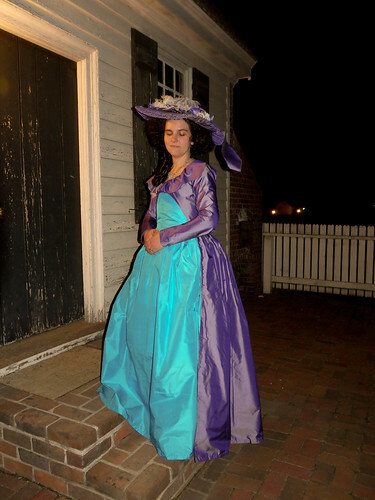 Today's post is about the portrait dress, and while I'm fond of this dress, it didn't turn out exactly as I'd hoped. The dress is based on the portrait of Mdme. 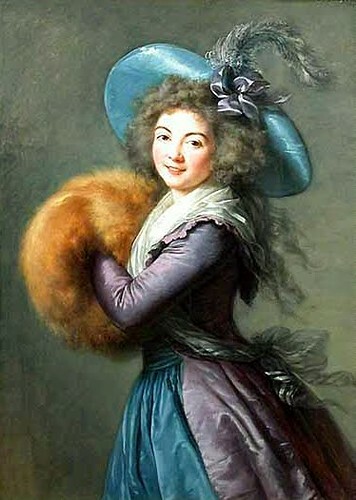 Mole Raymond by Elisabeth Vigee-Lebrun, which I love for its unique combination of teal and purple. Where the original is muted, my version is eye wateringly loud. I regret nothing. 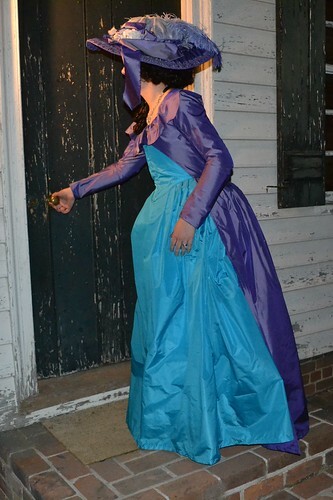 The pattern is exactly the same as the one I used for the Red Figured Silk Roundgown only modified to be an open robe with petticoat. It is a "zone front," which I just kind of figured out by trial and error. 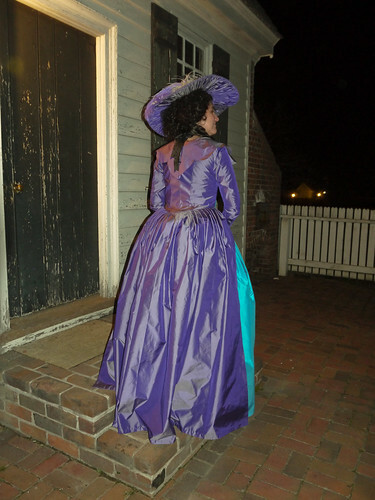 The collar is the same pattern as on the figured silk gown as well, only with scallops instead of vandyked edges. I might redo it since it doesn't hang exactly as I wanted, but then again maybe not. I didn't get very good pictures of the dress since I only wore it for an hour or so. It also ended up a bit big, so I need to figure out how to fix that before I wear it again. The hat is not my creation, but the creation of the very talented Jenny-Rose. It's gorgeous and over the top and exactly what the dress needed. I think I'm happiest with that part of the outfit. The rest of my photos can be found here. Yeah!! You did a portrait dress! Yours looks sooooo fabulous! I love the colors of the portrait and you matched them perfectly!